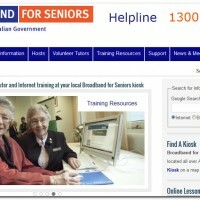 Older Australians now have greater access to training resources and information to help them get online with the Australian Government’s new Broadband for Seniors website. Labor Senator for New South Wales, Senator Doug Cameron, launched the new website at the 2012 Australian Computer Conference for Seniors in Sydney on 13 November. The Southern Highlands Computer Users Group website has been awarded first place in the ASCCA 2012 Competition. The Australian Seniors Computer Clubs Association (ASCCA), is the national peak body for seniors and technology, and has over 140 member clubs around Australia. The competition is a popular and much anticipated event. More than half of Australians over 60 are actively using online social networks according to research from Optus. The research, completed in October 2012, also found that 64% of over 60s use laptops and 68% used mobile phones, with significant numbers using smartphones (31%), tablets (22%) and e-readers (20%). More than half of U.S. adults over 65 use the internet, and one third use social networking sites such as Facebook, a report by the Pew Internet & American Life Project has found. However it found only 34% of those over the age of 75 use the internet. Overall, 82% of all American adults aged 18 and older said they use the internet. • Other iTunes features, including internet radio, Podcasts, iTunes U. A while back Google ran an online course titled “Power Searching with Google”. This series of lessons has now been made available for all. While Google is really easy to use, many people do not use it to its full advantage. Through this course, Google hopes to help you become even faster at finding what you need. Meeting Presentation: 3 July 2012. Good password practice involves using strong passwords and not using the same password for different accounts. But how do you remember all those passwords? Using a Password Manager has several important benefits, however your internet security is most likely to be compromised by a phishing scam where you unwittingly provide your username and password. Phishing emails are fraudulent email messages designed to trick you into disclosing personal information like usernames and passwords. These messages appear to come from legitimate sources such as banks, internet service or email providers. Phishing messages can appear at first to be authentic, with convincing images, logos or other content.